Scroll down to the bottom of the page. You will see Delete Your Account section. Click Delete Account. 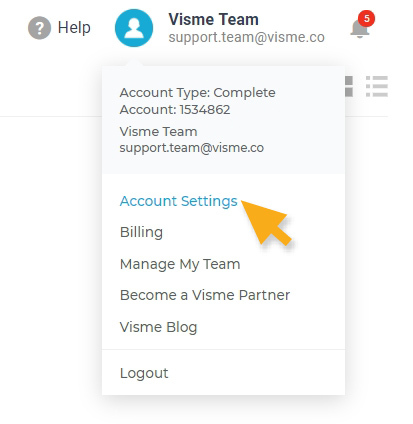 Note: Active paying customers can not delete account until they first cancel subscription. Click here on how to cancel your subscription. If you are part of a team plan, only your Administrator can delete your account. When Administrator delete his/her account, he/she will also delete ALL users and their projects under the account. A window will pop out asking you to confirm and that you want to permanently delete your account. If so, click Yes, Delete my Visme Account Forever! Note: This action is not reversible. 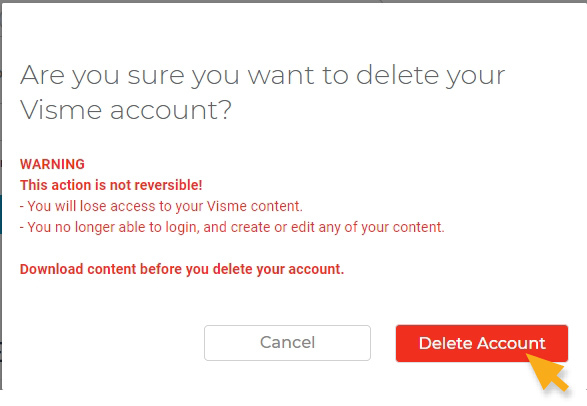 You will lose access to your Visme content. You no longer able to login, create or edit any of your content. If you intent to keep your content, do not delete your account or download your projects before you delete your account. An email confirmation will be sent to you. You must confirm the deletion from the link in the email that is sent to you. Account will not be deleted until this step is completed.